Cricket elections: Upali in one-horse race? Now the political election cavalcade is over for the time being. Suddenly out of the blues out came the Minister of Sports, Mahindananda Aluthgamage, announcing the dissolution of the incumbent Upali Dharmadasa’s Interim administration by the 14th of this month. Subsequently, the minister pronounced that the elections would be held as stipulated by the ICC by December 15, 2011. However the present interim committee could have gone on till 2013 before facing ICC sanctions. Till such time there was a good load of work that had to be accomplished by this (or whoever is there as a politically appointed agent) interim committee before it was hauled before the public. In 2004 when this Interim Committee came to life – set up by the then Sports Minister Jeewan Kumaranatunga -- the Thilanga Sumathipala administration had just been elected for a second time. The dissolution of the Sumathipala-led administration came following charges of some discrepancies in the cricket board accounts. But, the charges were never spelt out though the Interim Committee ruled for seven years under Jayantha Dharmadasa, Arjuna Ranatunga, a competent authority, D.S. de Silva and Upali Dharmadasa. Maybe the Sumathipala administration was not the heaven’s gift to cricket, but, as an entity it had life and was rolling. But, what cascaded owing to the governance of cricket affairs through political interference was pathetic. No one in authority was responsible for their actions and the state of affairs led to the Sri Lanka Cricket being left with empty coffers buried deep in the seabed. Then in cricket itself the game had been progressing in spite of the 1999 crisis, but selection blunders, even in the appointment of captains and vice captains, and political interference in team selection saw the Lankan game nose-diving especially after the stepping out of Muttiah Muralitharan from the ring. Today what Sri Lanka possesses is a deeply divided squad with payers indulging in the game just to preserve their positions and keep their feet wet. However, the appointment of Upali Dharmadasa as Interim Committee head cannot be termed outrageous as some of the other appointments down the line were. In the least he has come with persons in the caliber of Sidath Wettimuny who thinks and lives cricket without feeding upon it. When this committee came to occupy the crease its members did know that they had a limited period to act upon, if they were going to undo the bundle of rot packed by the Arjuna Ranatunga and the D.S. de Silva committees. Therefore, it is the responsibility of the politically appointed interim committees to pave the way for a viable and financially sustainable Cricket Board in the best interest of the game. Not that the current interim committee is also bent on doing all good. For instance suddenly you find some parasitical hangers-on at the Maitland Place building watching the third Test between Sri Lanka and Pakistan in Sharjah in an important enclosure. In this era of austerity how was he there and who is the benefactor and why? The people in this country who love cricket may like to know. Nevertheless, besides a few hiccups this committee at least went through its day-to-day affairs without much fanfare. We learn that even when some Interim Committee members travel abroad to attend to their cricket related official duties they go on their own fuel, without burdening the already bankrupt SLC accounts department. It is in this context that another matter comes into focus -- the state of the country’s cricket today. If the Cricket Committee of the present administration dies with the November 14 dissolution, there may be certain issues that need to be looked into by a competent authority until the next administration is put in place. The question is: Will this competent authority be competent enough to handle serious cricketing matters? The battered Lankan cricketers are due to return by the last week of December and a few days later they will take wing to South Africa. By then there should be someone in authority to talk to the team management and take some meaningful measures that would give the next tour management a fillip to cope with a gruelling tour. At the same time the present committee had negotiated a sum of Rs.750 million from the Treasury to take the ailing management out of its present predicament. It was promised to the management and the allocation may come after the November 21 budget. Now what would happen to this grant is also a question as worth as the promised sum. However, if the money comes along even the ensuing administration would have a cushion to step on where finances are concerned at the beginning of its term. Coming back to the elections, the talk of elections was in vogue even in 2007 where Jayantha Dharmadasa and Thilanga Sumathipala had been sharpening their swords for the battle. At that time Jayantha Dharmadasa told the Sunday Times, “Apparently the time has come for an election to Sri Lanka Cricket. It has become very imminent. Several clubs, district and allied organizations have been requesting me to come forward as their candidate this time and I have taken that invitation very seriously as I feel cricket at present requires good guidance”. 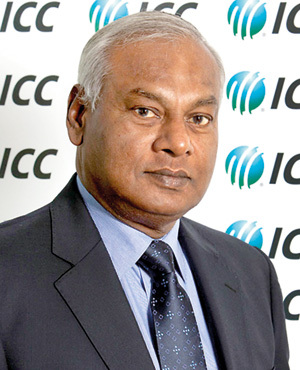 The then Minister Gamini Lokuge professed, “We have not set a date as yet, but, dissolving this present cricket administration is one of our priorities,” But apparently it all now points to a one-horse race where Upali Dharmadasa and his team would walk in uncontested at the end of the day. Through the grapevine we learn that Jayantha Dharmadasa may not be in the fray at the end of it while Sumathipala would be bound by his Parliamentary work leaving Upali Dharmadasa the only candidate. However, it must be stressed it is good even at the behest of the ICC the system of elected members is back on track. Even the club members should learn that it is their imprudent moves that brought forth the system of interim committees and political interference in the game’s administration. So even from this point they must think of ways of how to elect their representatives without other external affiliations that may not be related directly to the game. At the same time they also must seriously consider that in just 365 days it is not sufficient to effectively put a programme into action and the present election system and the governing period should be amended. Will we bring foreigners if there are no crowds?